Match the blue and red lines from the recycling map to the recycling calendar to know what week the recycle bin will be picked up. Have your trash container at curbside by 6:00 am on collection day. Pickup times may vary. Place your container at curbside, facing the street. Do not place your can on top of the curb. For those without a curb, place it within two feet off the blacktop. Do not place the following items in your trash container: hot ashes or coals, large quantities of dirt, sod, rocks or concrete, flammable materials, large bulky items, construction, remodeling, or demolition debris. Do not place item of length greater than four feet in the container. 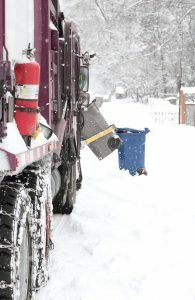 Any calls regarding garbage collection should go directly to Robinson Waste Service at 801-825-3800. If your can is damaged or needs repair, fill out the form above or call the Public Works Department at 801-451-2624. A lost container is the responsibility of the resident. A $50.00 deposit must be paid prior to the City issuing a replacement container. The container is the property of the City. When a resident moves the container stays with the property. Each container is numbered and assigned to a specific residence. Care should be taken to retrieve your own container after a windstorm, etc. Please call if you need to know your container number. Garbage containers should be placed at the curbside by 6:00am on the day of collection and be sure the container is not blocked in any way to facilitate automated pickup. If you have two or more cans place them at least 5 feet apart. All garbage must be placed in the container in bags to alleviate spillage of debris when can is emptied and to prevent offensive odors or flies. Lawn clippings should be bagged to ensure complete emptying of container. When clippings are placed in container without bags, they tend to stick to the bottom. Do not over fill containers. Spillage of garbage on the streets is more likely when lids are propped open because of excess garbage. Also during periods of high winds, containers may tip over if lids are not entirely closed. Customers who continually violate this standard will be asked to arrange for an extra container. In order to obtain a second container, a “Request of Extra Garbage Container” must be signed by the resident. This can be done either at City Hall or the Public Works Building. There is a $9.75 charge per month for the second container and it must be kept for a minimum of six months. The additional charge will be added to your monthly utility bill. The container should not be painted or marked in any way. The inside of the container should be kept clean and free from build up of fungus or bacteria. Do not deposit any hot coals or caustic materials in the container. Do not put dirt, sod, rocks, etc. in your container.